Russell Westbrook post game interviews are always entertaining. They may not always be very incitful, and he may not use many words. Nevertheless they are always straight to the point. The Thunder PG stands on absolutely no call to impress, he simply tells it like it is. Following OKC’s most recent contest against the Golden State Warriors, Westbrook was asked if he was, “on speaking terms” with Kevin Durant. There was no political response, no sugar coat, he simply said “No” and moved on. A video later released shows Westbrook telling a teammate, presumably Ennes Knater, not to speak to Durant. I am paraphrasing his quote because, after all, this is a family friendly site. In the process of being a short spoken fire cracker, Russ has taken the franchise on his back and become a triple-double machine. 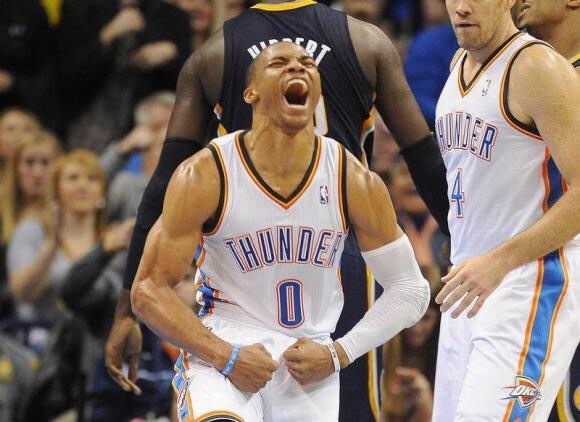 To me this is why Russell Westbrook embodies the City and the Thunder team that we love. I can’t lie. A few years ago I told Big Red that I thought OKC should build the franchise around Durant. My feelings were simple I thought his game was more mature and easier to build a team around. During the Chris Paul departure from New Orlens I even went as far to say that I thought OKC should make a play for CP3 even if that cost us Russell. I STAND CORRECTED! Now Kevin Durant has left us high and dry with a ” if you can’t beat ’em join ’em” move. And Russ signed an extension stating he loves OKC and its fans. I should have known it the minute I followed Durant on twitter. 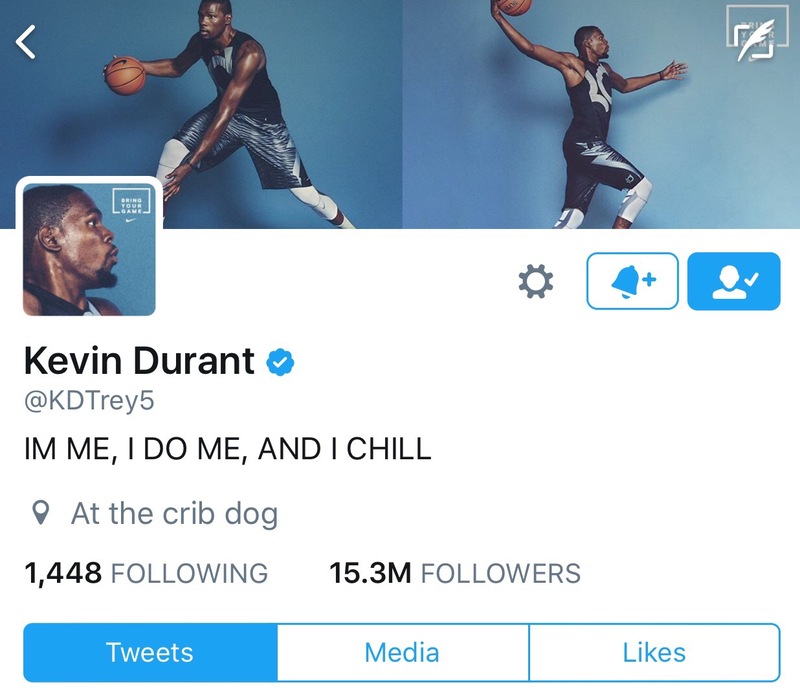 His bio reads simply, “I’m me, I do me, and I chill.” And that’s just not Oklahoma City. There are 100 reasons that is not what we need and why that is not Oklahoma. Oklahomans are gritty, tough, and hard workers. We are people who are opinionated, passionate, and loyal. It’s not me, it’s us. It’s not chill, it’s go hard or go home! I have read several articles accusing Russ of being stressed and burdened by having the franchise on his back. I don’t think that’s it at all. I think Russell Westbrooks passion was muzzled by the presence of the passive Durant. I believe we are seeing the true pitbull that is Brodie. I am a changed man and I am big enough to admit when I was wrong. The Thunder need Russell Westbrook and he is the perfect piece for our team to build on. I love the passion Westbrook brings to the floor, and I believe the locker room, franchise, and city and are all better for it. Russ is OKC and he represents us well. I am proud to be an Oklahoman and I’m proud to be a Thunder fan. At the end of the day, Brodie just makes it that much better!